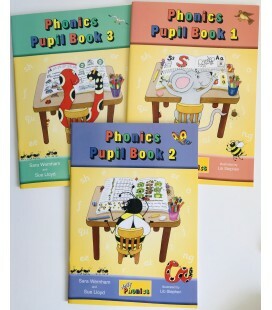 The My Jolly Phonics kit is an extensive range of Jolly Phonics material that have been carefully developed to be used at home and allow parents to help and support their children who are at the early stages of reading and writing. The kit is packed full of multi-sensory resources enabling the child to explore and learn in a fun and enjoyable way. All items are contained within a bright canvas case which the child is able to carry. There is even a slot on the case to add a picture of the child and if you open Snake’s mouth at the side of the case there are also a set of triangular grip pencils and and eraser. Everything your child needs to start learning to read and write!